Not too long ago, we had to take care of a completely preventable emergency. What could have been the cost of a $5 door sweep cost $50,000. The building was designed to have the fire pump room next to the drive through that went to resident parking. The fire sprinkler contractor basically said, bad idea. However, the builder moved forward with his plan. He placed a door in the fire pump room that went to this outdoor area. The door had a 1 inch gap. One day, there was an unexpected cold spell. The heat wasn’t on. The fire pump room was set off, away from the rest of the building. No one was aware of a problem until water started leaking through the door. The cold air was coming in through the 1 inch gap in the door. Everything froze. All of the pipe in the fire pump room. The 6 inch pipe was frozen solid. The control valve could not be closed until the pipe thawed, so the water just kept flowing. In the end, the backflow, fire pump, dry valve, and everything else needed to be replaced. Not wanting to spend $5 or listen to the fire protection contractor led to a $50,000 bill. 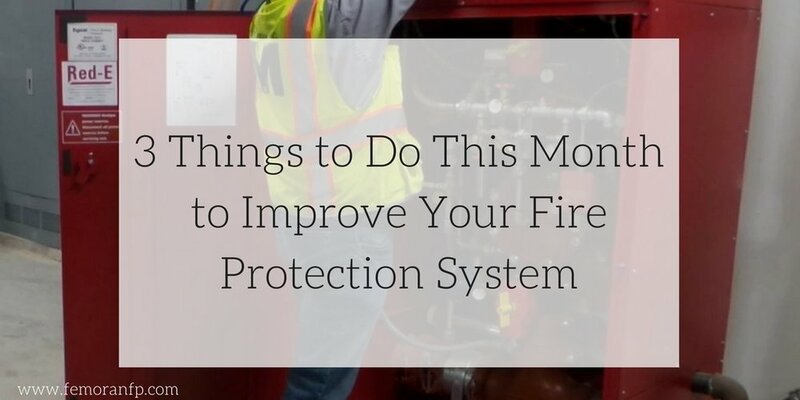 What are 3 things you can do this month to protect your fire protection system? 1) Inspect your gauges, control valves, dry pipe valves, and exterior pre-action valves. Valves must be accessible, open and close properly, be free of leaks and damage, and labeled. Gauges need to be inspected to ensure they’re in good condition and that water pressure is maintained. 2) Test electric motor-driven fire pumps. Complete a 10 minute run & flow test. Inspect fire pumps to ensure they are working properly. Check out a more detailed description of inspection needs at Hanover Insurance.